Our Top 5 Thanksgiving Tips! Part of what we love about the L&C Program is the flexibility to enjoy your holidays without feeling like you're "cheating" or going off the rails! Here are our top 5 tips for Thanksgiving! 1. Fill up on your favorite nourishing foods! Whether you're at home or traveling make sure you continue eating meals & snacks that are full of fresh veggies, lots of protein & healthy fats (avocados, seeds & nuts). Bring your own snacks to fill in the gaps & then enjoy your favorite foods in moderation! Also, remember to keep hydrated by drinking plenty of water throughout your day. 2. Watch your alcohol intake! You can still enjoy your favorite wine without going overboard...alcohol is dehydrating, affects our decision making processes (hello pecan pie! ), our sleep, hormones & metabolism. So if you choose to drink, enjoy it! But do so in moderation! Another great trick is determine the number of drinks you want to have BEFORE you do into the day/night. This helps you keep you limit & have a plan! 3. Keep moving! Take our workouts with you on your trips, sneak in an afternoon walk (to refresh your body & mind! ), go for a run in the morning (we have a great November playlist! )...do all that you can to stay active over your break. Make it fun, include your kids! Its good for everyone. Aim for at least 10,000 steps each day! 4. Keep tracking!!! This piece is SO important! It helps us stay aware of our intake & if we are eating enough protein. Keep up your progress by tracking to the best of your ability. Remember, consistency over perfection! 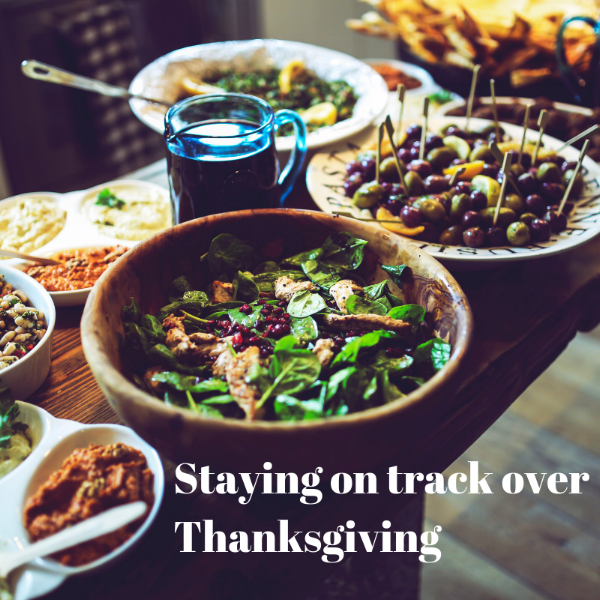 When in doubt, estimate but we promise that tracking your pumpkin pie will make it a whole lot easier to eat & enjoy in moderation instead of excess. It also holds you accountable and let’s you not slip too far into turkey la-la-land! 5. Stress less, enjoy more! Try to take some "you time" if you can. Sneak away for a hot bath, quiet walk, spend some time reading...just do little things throughout your break to invest in your own emotional & mental health as well as your physical health. Take some deep breaths & live & love the moments, no matter how stressful they may seem! We are so thankful for all of you and wish you a very happy and blessed Thanksgiving!